We are thrilled to note that Marketing the Moon is still getting positive reviews, this one from the Western Pennsylvania History Magazine. It is published by the John Heinz History Center in Pittsburgh, which is currently hosting the Apollo 11 command module as part of its recreation of the 50 state tour that was featured in our book. Click on the link above, or the photo below, to access the review. Posted on November 15, 2018 by Richard Jurek. Marketing the Moon co-author Richard Jurek will be appearing with legendary astronaut Capt. Jim Lovell for a fund raising presentation at the Lake Forest Historical Society in Lake Forest, Illinois on May 5, 2016. Click on the picture below for more information, and to register for the event. To register for the event, just click on the image above! Posted on March 25, 2016 by Richard Jurek. Marketing the Moon was included in this amazing list of legendary non-fiction books for fans of The Martian to read by New in Books, which has over 30,000 followers on Facebook. Posted on October 2, 2015 by Richard Jurek. Author and science/technology professor Matthew H. Hersch reviewed the book in the May 2015 issue of the Smithsonian's Air & Space magazine, writing that "'Apollo is the largest, and we believe the most important, marketing and public relations case study in history,' claim the authors, and they make their case with a compelling mix of oral history, archival documents, and pop-culture flotsam. The campaign to sell the moon landing program was as engineered as any other aspect of Apollo: brilliantly, with the same mixture of patriotism, greed, and messianic fervor. Within a decade, these efforts built enthusiasm for space travel by selling it to reporters hungering for a brighter future. Over-sized and richly illustrated with ephemera, television screen grabs, and period photographs, Marketing the Moon is half coffee-table book, half marketing history, and all fun." Posted on March 28, 2015 by Richard Jurek. Co-author Richard Jurek appeared on the popular, nationally syndicated public radio program "Backstory: With the American History Guys" during Super Bowl Weekend in 2015 to discuss the history of marketing and advertising during the US space program in an episode titled "New & Improved: The History of Advertising in America." Posted on February 2, 2015 by Richard Jurek. Corey S. Powell wrote an enthusiastic and detailed review of "Marketing the Moon" in American Scientist magazine titled "The Men Who Sold The Moon." Powell writes: "Something profound had changed since the early days of the heroic, untouchable space heroes. 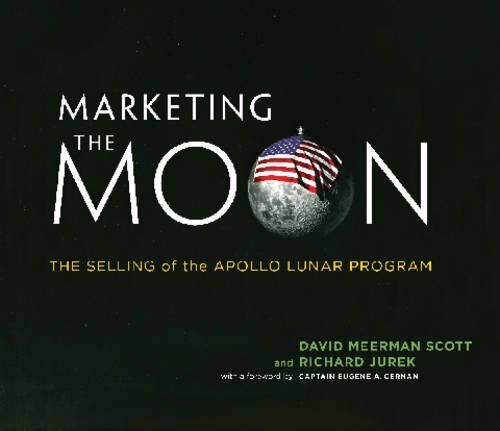 In Marketing the Moon, David Meerman Scott (no relation to NASA’s David Scott) and Richard Jurek do a masterful job defining that something and placing it within a much broader exploration of how the U.S. space program acquired such mythic status in the first place—before it abruptly, sadly crumbled away. Along the way, the authors achieve something I doubted was possible: They provide fresh and important insights into the Apollo program, nearly half a century after the fact." Posted on January 31, 2015 by Richard Jurek. Terry O'Reilly, the influential Canadian author, speaker and broadcaster of the popular syndicated public radio program, "Under the Influence," specializing in exploring unique marketing and advertising topics, gets inspired by our book "Marketing the Moon" -- and he features it in this week's episode. It reminds him of the time the Apollo 17 crew visited his home town of Sudbury, Ontario, for geology training...and of the pioneering marketing and brand journalism efforts of NASA public affairs. It was a wonderful surprise to open up the December 9th issue of The New York Review of Books and see the following MIT Press Holiday book advertisement, featuring Marketing the Moon as the lead book. Get your shopping in early for the holidays! Posted on December 1, 2014 by Richard Jurek. Proud to note that the Library Journal has just ranked Marketing the Moon as on of the top 10 (actually coming in at number 9) best-selling books to libraries in the Engineering & Technology category YTD for 2014. "Sally Ride: America’s First Woman in Space" and "Marketing the Moon" are the only two space books reaching the top 10 YTD in library sales! For those of you who have asked your libraries to stock the book, we thank you! Posted on November 13, 2014 by Richard Jurek. We are thrilled to announce that Nikkei Business Publications is publishing a Japanese translated edition of Marketing the Moon ( 月をマーケティングする アポロ計画と史上最大の広報作戦 ), and it is available for pre-order for Amazon.jp customers. Its official publication date is October 18, 2014. The book has been completely re-imagined, with an exciting new layout and paperback edition totaling over 500 pages. Click on the image of the book's Japanese cover to be taken to Amazon Japan listing for the book. Posted on October 4, 2014 by Richard Jurek.